White Pelicans do not dive for fish like Brown Pelicans, but instead dip their heads underwater and scoop up fish in their enormous bills. They will sometimes fish cooperatively, when fish are plentiful, several individuals will “corral” fish into a circle. They then dip their heads simultaneously under the water to catch the fish. 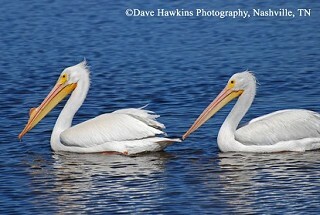 White Pelican nest on lakes in the Northern Great Plains and in scattered locations in the western mountain states. In winter they are found in California, Florida, around the Gulf Coast into Mexico, along the Mississippi River and in the larger lakes in TN. The White Pelican, once rare in Tennessee, seems to be increasing it's range in TN and is being seen in winter State-wide. Description: The huge yellow bill of the White Pelican makes it quite unmistakable. It is overall white with long, broad wings, with a black trailing edge. Similar Species: None. Occasionally confused with flying Whooping Cranes, which are extremely rare in Tennessee. Habitat: In Tennessee, found most often in shallow bodies of water, rivers and lake edges. Status in Tennessee: Increasing in numbers in Tennessee especially in winter. When prey densities are high, White Pelicans will fish cooperatively. Several individuals move together to either encircle and concentrate fish, or drive them into shallow water. The pelicans will then simultaneously dip their heads into the water to catch the fish. The oldest known American White Pelican was 31 years, 6 months old! With a wingspan of 9 feet, the American White Pelican is one of the largest birds in North America. Best places to see in Tennessee: Reelfoot Lake, Kentucky and Lake Barkley and other large shallow bodies of water, rivers and lake edges across the state. Evans, R. M. and F. L. Knopf. 1993. American White Pelican (Pelecanus erythrorhynchos). The Birds of North America, No. 57 (A. Poole and F. Gill, Eds.). Philadelphia: The Academy of Natural Sciences; Washington, D.C.: The American Ornithologists Union.